Another black man killed by a white cop. Another front page. Todays’s New York Times is chilling. 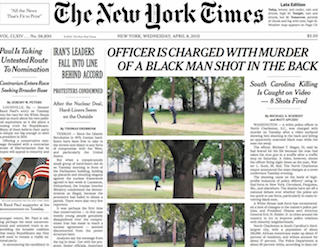 It features stills from the video that captured police officer Michael Slager gunning down Walter Scott as Scott fled. Slager has been charged with murder, but once again—as we asked with The New York Daily News’ cover on Eric Garner—why does a front page like this even exist?